Last week I read a paper at the International SBL in which I argued that it is more likely than not that Philemon and Onesimus are actual brothers. This isn’t, of course, the consensus view, according to which Onesimus is the slave of Philemon. Before I read my paper I gave a brief account of my reconsideration of their relationship. Several years ago I was teaching Bible study methods to undergrads and we were doing an exercise with the text of Paul’s letter to Philemon. 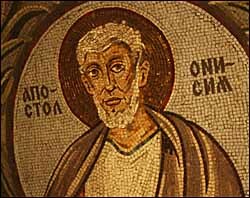 A student raised his hand and noted that according to the text it appeared that Onesimus was the brother of Philemon. Perhaps the reason he was separated from you for a little while was that you might have him back forever—no longer as a slave, but better than a slave, as a dear brother. He is very dear to me but even dearer to you, both as a fellow man and as a brother in the Lord (NIV). Maybe this is the reason that Onesimus was separated from you for a while so that you might have him back forever— 16 no longer as a slave but more than a slave—that is, as a dearly loved brother. He is especially a dearly loved brother to me. How much more can he become a brother to you, personally and spiritually in the Lord (CEB)! I told him that I’d need to look at that a bit more closely and get back to him at a later point (one of those unfortunate classroom moments when you don’t have a ready answer–ugh!). As I dipped into commentaries over the subsequent weeks and months, I was increasingly disappointed by how commentators treated Paul’s expression. The NIV’s and CEB’s renderings represent how nearly every major commentary I’ve looked at handles Paul’s expression. The NASB, on the other hand, is a pretty good literal translation of the Greek text. My paper questions this consensus and I’ll discuss some of the aspects of my argument in the next few weeks. Very interesting! That thought never crossed my mind, but when Paul does juxtapose sarx/sarkos with something else in places like Romans the idea is physical/biological in contrast with Spirit, or in Christ, and so forth. You may cover this in subsequent posts, but my immediate question would be whether or not we find many examples in the ancient world of someone’s brother being their slave, since it does seem that whether or not Onesimus is related to Philemon he is indeed his slave, but maybe you have a surprise for us there too? It wouldn’t have been uncommon for a paterfamilias to have “children” through female slaves. In such cases, they wouldn’t be considered his children, nor he their father. They had the status of their mothers–slaves. It may well be that this is what’s going on here. In fact, I think this is the most likely scenario. Very interesting. I’m excited to read further posts on this. Here, Paul uses the words “flesh” and “brethren” to indicate his tribal or national kinship with all other Jews. If Paul is using the same sense for flesh in Philemon, wouldn’t he be saying that Philemon and Onesimus are of the same “people”, Greeks, Gentiles, or perhaps a more specific nationality or tribe, to which Paul, as a Jew, does not belong? In Philemon, the expression is en sarki, whereas in Romans 9, it’s kata sarka. I’m not sure the difference is significant, but I need to check this out. All this is to say that the parallel between the two doesn’t function to indicate that Paul is speaking of nationality or tribe in Philemon, but the realm of earthly relations when he uses sarx. I do understand that there are contextual differences between the Philemon and Romans 9 verses; but is the word translated “brethren” in the NASB in Romans 9, the same word translated “brother” in the NASB in Philemon? If so, then Paul is using the word flesh in Romans 9 to indicate the specific meaning he has for brethren, i.e. fellow Jews. He uses the term brother(s) in the broader sense of fellow Christians as well in Romans 9, but distinguishes it in chapter 9 with the word flesh to indicate that he is there referring to Jewish Christians, not Gentile Christians. Isn’t the same thing happening in Philemon? Both Paul and Philemon are brothers to Onesimus, as you say, “in the realm of faith”, but only Philemon is a brother to Onesimus “both in the flesh and in the Lord.” We have an example (in Romans) of Paul qualifying the word brother with the word flesh, and we know he means the common people of Israel. Why would he not be using the same meaning here? So, in Romans there’s a qualifier, but in Philemon there isn’t. I’m not sure I understand you. Aren’t you already arguing that “flesh” is a qualifier for “brother” in Philemon? Paul is a brother to Onesimus, but not “in the flesh” as Philemon is. It seems to me that we are both saying that “flesh” distinguishes the kind of brother Onesimus is to Philemon (as opposed to or in addition to the kind of brother he is to Paul). The only difference seems to be that you see brother “in the flesh” as meaning an actual brother, while I’m pointing out that, in the only other similar example in the NT, brethren “according to the flesh” are fellow kinsmen with a shared ancestry. Yes, I think you’re understanding me about how I see Philemon and Onesimus as being actual brothers. So, the “fleshly” relationship in Philemon is being actual brothers. The “fleshly” relationship in Romans 9 is being kinsmen. Well, not really. I do see that the grammatical construction is a little different. But in both cases, the word “flesh” is necessary to indicate what kind of brother Paul is talking about. Paul uses the word “brother” four times in Philemon and in each instance he is referring to his (Paul’s) relationship to Philemon. In only one of the four instances does he ALSO mean the relationship Onesimus has to Philemon, which he characterizes as “both in the flesh and in the Lord” (presumably Paul is a brother in the Lord, but not in the flesh). In the book of Romans Paul also uses the word brother on many occasions in the sense of “in the Lord”, so when he is speaking of Jewish brothers, he has to qualify the term, which he does, on one occasion by saying “my brethren, my kinsmen according to the flesh,”. I can think of no other occasion in the New Testament in which the word flesh is used to modify the word brother, except these two instances in Romans and Philemon. In both cases the word clearly distinguishes one type of brother from another type. The Romans verse makes it clear that flesh refers to the kinship of the Jews. I don’t see why this example is so disimilar to the verse in Philemon, or why you see “in the flesh” as a clear indication of an actual brother. I’m also not sure what you mean when you say that the “flesh” reference in Romans is metaphorical. Whether a flesh brother refers to a kinsman or the son of the same father, the usage would be no more or less metaphorical. “Flesh” is qualifying “kinsmen” in Romans and “brother” in Philemon. In Philemon, “brother in the flesh” means an actual blood brother (at least that’s what I’m going to argue). In Romans, “brother” is metaphorical because just after it, Paul qualifies it NOT with “according to the flesh,” but with “kinsmen according to the flesh.” So, it’s not that Paul is referring in Romans to his actual brothers (his blood siblings). He’s referring to his fellow Jews. So, I’d agree that the two phrases “according to the flesh” and “in the flesh” are parallel, indicating the sphere of earth-bound relations. It’s just that in Philemon, Philemon and Onesimus are brothers in that sphere, and in Romans, Paul and his fellow Jews are kinsmen in that sphere. I look forward to reading your argument. While the notion Onesimus and Philemon were brothers isn’t objectionable in and of itself, the deeper issue here is how Paul uses the word ἀδελφός (brothers). It drives me crazy when Christian translators impart meaning to Greek words unique to theological intent. Outside of biblical translation ἀδελφός always means kindred, blood relations, brothers and cousins, related through a common ancestor. So what warrant is there for thinking it is a figurative description of members of the Church? In every instance where Paul uses the word ἀδελφός (without exception), there is a case to be made he is speaking to Hellenized Israelites of the House of Israel (as distinguished from Israelites and Edomites of the House of Judah). For example, his audience in Romans is clearly noted to be Israelites. He references a common ancestor there [Rom 4:1] “What then shall we say was gained by Abraham, our forefather according to the flesh?“. He speaks to Israelites about scripture they would be familiar with [Rom 4:9] about topics of concern to them [Rom 11] and frequently calls them ἀδελφός (meaning fellow Israelites, blood relatives) [Rom 1:13; 7:1,4; 8:12,29; 10:1, 11:25; 12:1,10] etc. And it’s not just in Romans Paul does this. He also speaks to kinsmen exiles גָּלָה (H1540 galah) of the House of Israel in [Gal 6:1,18] as brothers and others [Phil 1:12,14]. There isn’t a single example where an argument couldn’t be made Paul’s use of ἀδελφός is referencing Israelites. People refuse to accept the Greek at face value to read it plainly. Instead the language gets, strained through the filter of theological presupposition. Kudos to your student for reading the text plainly (believing it) recognizing a blood relationship where others missed it. Though I would argue Onesimus and Philemon were brothers of a common ancestor (meaning Abraham, Isaac and Jacob), rather than brothers of a common mother. Paul does indeed use “brother” often, but it seems it’s often metaphorical for the family of faith. I’m not sure that all uses include only children of Abraham. Tim, That’s an unwarrented assumption. That something ‘seems’ so, doesn’t make it so. Many things seem many ways for fallacious reasons, such as ‘ad populum’. It seems as though the sun goes around the earth, and that the earth is flat. This perception is false. A fallacy does not cease to be a fallacy because it is fashionable. Your student, un-brainwashed by fashion, read [Philemon 1:16] and too it plainly to be familial rather than metaphor. She pointed out that an actual physical relationship was alluded to. This alone is reason enough to question the popular presupposition that Paul spoke metaphorically for this presupposition is what prevented everyone else from seeing what your clear thinking student saw. Everyone who presupposed that Paul spoke metaphorically now sees this verse as a dilemma that requires solving (including you). However this reason is not the only reason. I’ve provided a second more concerning reason. If a Greek word bears a meaning plainly everywhere in secular translation except in a select handful of theological translations – there is cause for concern. When a word is imparted with non-standard meaning for theological reasons (ἀδελφός was a familial descriptor, not a metaphorical one) that too is reason to look for warrant for believing a particular presupposition is true. Clearly in the case of Philemon, your recognition of the problem has led you to question the meaning of ἀδελφός. You’ve concluded Onesimus and Philemon are brothers but Hebrew thought had familial cognates. Anyone with a common ancestor could be considered ‘brother’ as Paul’s Roman quotes show. Jesus said ‘We have Abraham as our father’ [Matt 3:9]. He was speaking of ‘son’ as a Hebrew cognate for grandson, great-grandson etc. A diligent academic would therefore explore the scope of this cognate of Philemon and Onesimus being brothers or fellow kinsmen. Did they share a common father in the restrive sense, or a common great-great-great grand father in the typical Hebrew sense?Surely exploring the scope of this cognate is a valid exegetical question? Just to make sure I’m understanding you, are you saying that all uses of “brother” or “sister” by Paul in his letters refer to other children of Abraham? Are there any non-children of Abraham in the NT? 2. They are embedding theology in their translation (because of presupposition). To be specific though, show me a biblical instance and Ill make the case for it. Romans, for example, Paul says plainly he is writing his kinsmen in Romans when he writes “Or do you not know, brothers—for I am speaking to those who know the law” [Rom 7:1]. It would be irrational to argue that he was addressing non-Israelites who didn’t ‘knew the law’, or share a forefather, twice referenced [Rom 4:1; 9:10]. In Romans the only way ἀδελφός may be taken is according to the standard Greek sense ‘kinsmen of a common ancestor’, i.e. Israelites. (Have not not seen how linguistically son, grandson, great-grandson are all written the same, just as father, grandfather, great-grandfather are all written the same? In Hebrew, there is only one word for all male ancestors – ‘father’, just as there is only one word for all female ancestors ‘mother’. The generation of relationship doesn’t matter in Hebrew thought. It only matters whether or not you were connected to the root of the tree). You make a good case, and certainly we should give priority to a plan greek meaning. But it might also be the case that the so-called theological presuppositions might actually be similar to Paul’s. Galations comes very quickly to mind where much of th point of Galations is who are the children of Abraham (Gal 3:28) and naturally in Galation Paul uses ἀδελφός to mean believers in christ e.g. Gal 3:15, or 5:13. We don’t know Paul’s presuppositions. We might infer that he thought like an Israelite, that he was ashamed of his former persecution of Messianic followers, etc., but exposing his presuppositions is part of exegesis. Yes, it is possible so-called theological presuppositions might be similar to Paul’s, but then they might not – which is why we should demand warrant for our presuppositions (when we examine later presuppositions). We can’t simply credit later translators with knowing what Paul thought. With respect to Galatians, not so fast …. We know Paul was addressing the congregations (ekklesia) in Galatia Γαλατικός (G1054). Galatia was Greek speaking, however at least two ancient historians tell us that Galatian’s were actually Achaemenids who spoke Greek (Herodotus and Strabo). They were known as Leuco-Syrians who invaded the area as mercenaries under Xerxes I (the battle of Thermopylae). The Leuco-Syrians formerly constituted the third Satrapy of the Seleucid Empire (presumably folks recognize this to be Assyrian). So if the Greeks saw the Galatians as Leuco-Syrians rather than Greeks how can we conclude he was making an argument to non-Israelites? Has anyone disproven the idea that the Galatians weren’t in fact Israelites of the dispersed House of Israel (as suggested in [1 Peter 1:1] and [John 7:35])? From the perspective of perspicuity, Paul’s argument in [Gal 3:28] is saying that the Galatians faith proves them to be Israelites, given that they recognized the messiah (recall Jesus’ words “My Sheep hear my voice” [John 10:27] echoing [Psa 95:7] describing Israel). The meaning of the word Galatian (Γαλατικός G1054) itself attests to this. -τικός: is the common Greek suffix meaning “characterized by”. Think of anti-bio-tics meaning ‘characterized by voiding life’. The name Galatia means ‘characterized by being an exile’. Accordingly there is no sufficient warrant for believing Paul was speaking to non-Israelites in Galatians either. It is likely he was speaking to displaced Israelites of the Assyrian dispersion. I’m happy to rexamine our presuppositions. But this one seem rock solid. Andrew, Paul describes Titus as his brother (2 Cor 2:13) and also as “Greek” (Gal 2:3). This shows, I think, that Paul used the word “brother” also for those whom he classed as non-Jews. This is true even if, as I believe, “Titus” was Timothy’s praenomen. Fellowsrichard, and you believe that just because Titus spoke Greek he was not an Israelite? Do you have proof of this? I suggest you read [1 Peter 1:1] and [John 7:35] more carefully. There were non-Jewish Israelites know in Jerusalem as ‘Greeks’, known to Greeks as Leuco-Syrians (at least according to Herodotus and Strabo). Ed, I’m not quite sure what you mean. ἔθνος in Greek means ‘nation’ or ‘nations‘ or ‘nationals‘. In Homer and all other ancient Greek work, ἔθνος doesn’t carry with it the specific implication of ‘non- Israelite’. This preoccupation is only a theological one so only in English biblical translation is this meaning suggested. ‘Ἕλλην in Greek meant simply ‘Greek’ and also doesn’t carry with it the implication of ‘non-Israelite’. There were certainly Greek Israelites of the dispersion as we already know from [1 Peter 1:1] and [John 7:35]. So if you’re asking if the book of Galatians in Greek makes reference to non-Israelites, it doesn’t specifically say one way or the other, so I don’t know how to answer you. With respect to [Gal 3:7] I’ve already indicated I agree that faith is evidence one is a Sons of Abraham (an Israelite) for the very reason Jesus gave. Jesus said ‘My sheep Hear my voice‘. Faith is evidence of that one is a son of Abraham specifically because God promised ‘I will be your God and you will be my people‘ so I’m not sure what the objection is. A presupposition isn’t rock solid if it is founded on unproven assertions which are in fact false. 3. colleague, associate, PTeb.1.12, IG12 (9).906.19 (Chalcis); member of a college, ib.14.956. 4. term of address, used by kings, OGI138.3 (Philae), J.AJ13.2.2, etc. ; generally, LXX Ju.7.30; esp. in letters, PPar.48 (ii B. C.), etc. :—as a term of affection, applicable by wife to husband, LXX To.10.12, PLond.1.42.1 (ii B. C.), etc. Sorry Andrew, it is not good to generalize without proof. Generally, textual and historical studies don’t speak in terms of “proof” (the usual joke goes “proof is for mathematicians and brewers”). The best one can offer are references, which are of varying merit and authority. Copying and pasting from Logeion is doesn’t really fall under the category of “proof”. People will jump through some pretty exceptional hoops to avoid plain meaning. This is the problem with Theological use of Greek in biblical research; it has an agenda that runs contrary (and independent) to the plain convention of ancient usage. So by the same thinking presented above, we apparently cannot generalize ‘cousin’ as meaning ‘related through a common ancestor’ either …. How about this for a counter argument since we are talking biblical usage, try finding an instance of the use of the word ἀδελφός in the LXX where it didn’t mean ‘brothers, siblings, or members of the same tribe’ precisely. Gn 14:14, Gn 24:29, Gn 25:26, Gn 27:30, Gn 29:12, Gn 33:1, Gn 37:27, Gn 38:29, Gn 38:30, Gn 42:15, Gn 42:19, Gn 42:38, Gn 43:3, Gn 43:5, Gn 43:29, Gn 44:20, Gn 44:23, Gn 44:26, Gn 45:4, Gn 48:19, Ex 7:7, Lv 25:49, Lv 26:37, Nm 8:26, Dt 25:5, Dt 25:7, JoB 15:17, JgsB 9:3, JgsB 9:18, JgsA 1:13, JgsA 9:3, JgsA 9:18, 2Kgs 3:30, 2Kgs 13:20, 2Kgs 20:10, 2Kgs 23:18, 2Kgs 23:24, 3Kgs 16:22, 1Chr 2:25, 1Chr 6:24, 1Chr 8:14, 1Chr 8:31, 1Chr 9:37, 1Chr 11:20, 1Chr 11:26, 1Chr 11:38, 1Chr 11:45, 1Chr 24:25, 1Chr 27:7, 2Chr 31:12, 2Chr 35:9, 1Esd 1:9, 1Esd 5:56, TbBA 3:15, TbBA 7:12, TbS 3:15, TbS 5:14, TbS 7:12, 1Mc 2:65, 1Mc 5:24, 1Mc 5:55, 1Mc 9:33, 1Mc 10:74, 1Mc 14:17, 1Mc 16:9, 2Mc 4:7, 2Mc 14:17, Ps 48:8, Prv 18:19, Prv 27:10, Qoh 4:8, Jb 30:29, Mal 1:2, Jer 9:3, Ez 4:17, Ez 47:14 etc. Look especially at verses such as Dt 1:16 where ἀδελφός doesn’t mean actual siblings but fellow Israelites. A familiarity with Greek usage in the LXX might greatly benefit greatly NT scholars. Just saying.